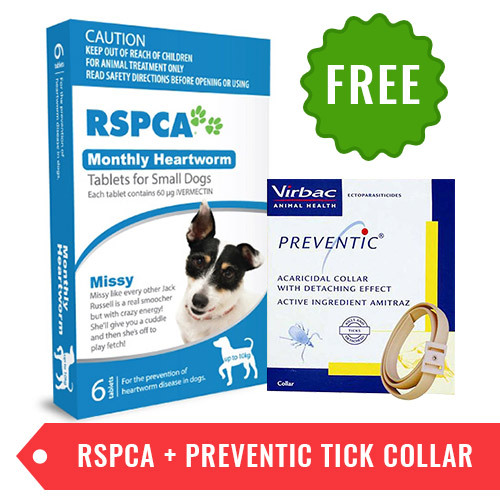 RSPCA Monthly Heartworm Tablets are a monthly generic heartworm preventive, that protects all sizes of dogs from deadly heartworm disease. It is one of the most affordable and effective option to control deadly heartworm disease without having any adverse effect on the health of the dogs. Each tablet of this heartworm preventive consists of Ivermectin. These tablets assist in preventing heartworm disease in dogs by eliminating the tissue stage of heartworm larvae (Dirofilaria immitis) that affected the dog 30 days prior to giving the treatment. RSPCA - One Word to describe this drug " Benevolent". Best heartworm preventive at great price. It was quite expensive for me to maintain monthly heartworm preventives due to its heavy prices. But now wtih RSPCA, nothing is expensive. Low price and good quality. Happy for the product. Good product and happy with service and prices. Purchased for the first time and looking to come back. I depend on this product to prevent heartworm in Rocky. Ever since I have seen prices at bestvetcare, I am ordering from them only. Great prices and best customer service. can try once.